Its show vs show, radio vs podcast, as the Adelaide Visa Council deliberates over the overt attempt by hosts of The Show on PBA FM to obtain a Visa. Will it succeed? Will it fail? Will both programs’ presenters rattle sabres for weeks to come? You find out in this episode. Clue: Ribbit. 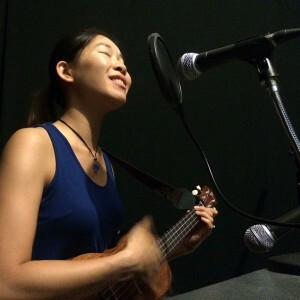 Florence Lang, pictured, joins us live to play her new song AND make ukulele history! What do a famous cricketer from South Australian history and a famous cricket umpire from Adelaide have in common? They are both linked to presenters from our podcast. Brett Monten is related to John Collard Cocker, the man who laid the first pitch on Adelaide Oval. Steve Davis, through the quirks of social media, fields irate comments from Indian cricket fans about umpiring decisions made by cricket umpire, Steve Davis. In fact, Steve has been drawn into this world so often, he now has a page on his personal website dedicated to his cricket umpiring persona – meet the real Steve Davis. Brett celebrates his birthday by providing the wine, thanks to Alice from his work who listens to us at high speed?! Plus we chat about the new Adelaide City Library, National Geographic featuring Adelaide as a Smart City and plenty more. Intro: Our original theme song is here, Adelaidee Hoo. Note, throughout the podcast we also use free sfx from freesfx.co.uk for the harp, the visa stamp, the radio signal sfx, and the swooshes around Siri. South Australian Drink Of The Week: St Hugo 2010 Barossa Shiraz. Tasting notes. Shout outs: Steve says hi to Kim Bennett his financial adviser he met through FIVEaa work who just missed being killed by a falling tree on the weekend. And a hi to Sharon Smith, Visa recipient, who confirmed I never had to check her spelling. Colin says hi to Bryce from City Mazda. Stories without notice: Steve: Steve got to christen the new Adelaide City Library with his social media workshops on Tuesday night – there is talk of doing a recording from the library’s multimedia room. Colin: Adelaide to feature in National Geographic’s Global Smart Cities series. Interviews: The interview this week was with Florence in Brett’s Musical Pilgrimage. The Show at PBA FM. The whole team is before the Council. Susan Lily gets a gong. Paul Adams gets a Visa for his follow up from last week. Adelaide’s Yesterdays with Colin: Colin digs into Brett’s family history and his links to pubs and cricket in Adelaide through John Collard Cocker.